Photo courtesy of Lura Enterprises Inc. The Lightning Strike Roller Screed first made its name at the 2007 World of Concrete show, where it won the Most Innovative Product Expert's Choice award in the placement tools and equipment category. 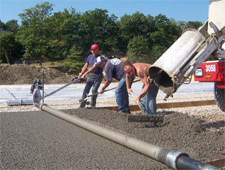 The screed was developed by Dennis Lura to offer a simpler way to lay concrete professionally without needing an experienced crew. A roller screed is a pipe suspended over a wet concrete surface. A motor spins the pipe in the direction opposite to which it is pulled. 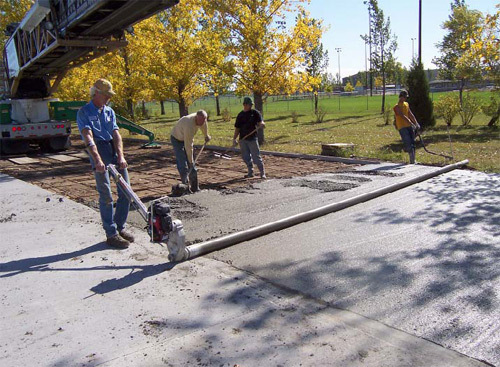 When dragged across the wet concrete, the roller levels and smooths the surface. Lura improved on the basic concept. Initially, he built one for his own use, but as other contractors borrowed the prototype and provided suggestions, Lura refined his invention. Today, the tool meets contractor needs in part because it was modified in response to contractor feedback. It's manufactured and sold by Lura Enterprises Inc.
What makes Lightning Strike different from other roller screeds are its riser wheels, steel wheels with bearings inside them to reduce friction when they roll over uneven surfaces. The wheels elevate the tube 1/8 inch above the surfaces on the edges of a pour. Also, there's the screed's patented threaded axle, which allows for attachments to be screwed on. One such attachment is wall plugs, which allow the Lightning Strike to operate against a wall. The axle also allows the screed length to be adjusted easily. The most popular Lightning Strike package can deliver 18 different screed lengths. An adjustable curb runner can hang off a curb and drop down in half-inch increments, a feature that has been a huge hit with contractors. More recently, contractors asked Lura if he could develop a wall-walker feature that drops down in quarter-inch increments and can hang off up to a 54-inch wall, but is a little bulkier. He did. Lura offers an electric-motor version of the Lightning Strike Roller Screed, but he found that contractors prefer the gas-powered motor because it gives them the freedom to work without worrying about cords. What contractors like best about the Lightning Strike Roller Screed is its ease of use and its ability to save money, especially when compared to truss screeds, Lura says. "Truss screeds have their place, but they are also very heavy and expensive. They also take a long time to clean." In contrast, the lighter Lightning Strike Roller Screed needs fewer people to operate it. It cleans up in five minutes. Doug Bannister, decorative concrete expert and owner of The Stamp Store in Oklahoma City, learned firsthand how even the most inexperienced concrete worker can use the Lightning Strike Roller Screed with ease. Earlier this year, Bannister was installing a performance pad and conducting an introductory stamping class at the Children's Museum of Phoenix as part of the Concrete Decor Show & Decorative Concrete Spring Training. Dale Lura approached Bannister and asked if he wanted to try the Lura screed. "I was a little apprehensive," says Bannister. "We weren't going to use any forms in this project. We were pretty much placing the concrete on the ground and using the natural concrete as it came out of the wheelbarrow to shape the edges." Without forms, the screed ran on pieces of wood lying free on the ground, and the smoothed surface mimicked the natural contours of the ground. The gas-motor-powered roller screed was so light and easy to use that it required only two inexperienced people to operate it. "Dale showed the guy with the throttle where to hold it and to stay put," says Bannister, "and went to the other guy and told him to pull it every once in a while. We dumped the concrete on the ground and the roller went across the top of it and gave me a really flat surface. It was phenomenal. I couldn't believe a mechanical device like that could be so adaptable to the terrain and the conditions." Bannister was so impressed with the product that he said that using it would be one of the few reasons he would consider returning to contracting.